Bow-Belles String Trio is a group of talented musicians specialising in music entertainment for weddings and celebrations. The trio, which consists of two violinists and a cellist, can provide music for the pre-ceremony, ceremony, drinks reception and wedding breakfast. Our repertoire of popular classics and contemporary modern music from Bach to The Beatles and Ed Sheeran ensures we'll add sparkle to your special occasion at prices starting from just £300. 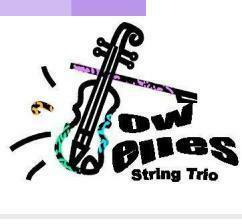 We are a professional String Trio who work within Herts, Beds and Essex. Our easy booking, friendly approach and experience of working within the counties ensures that your wedding music is in the best hands. We play at all the top wedding venues ... click here to see if we've played at yours! We occupy less space than a string quartet which could be ideal for a smaller room. Whether it be a large or small venue, we offer a service that has a full repertoire and great sound for a cheaper price! Venues: Please see the places we've played.